I haven’t been to our local cafe much recently, but managed to make it both this week and last week. 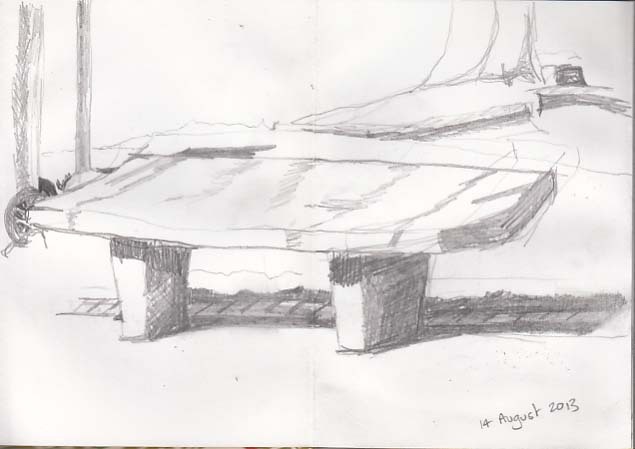 When I checked back through my sketchbook I found my drawings from early August. So here they are earliest first. 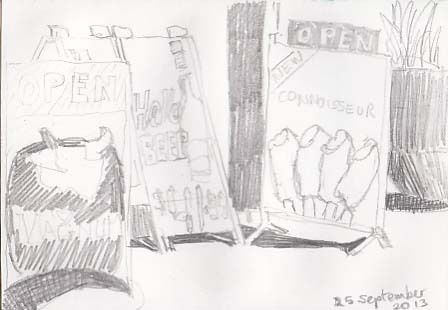 This week I did a pencil sketch of the signs outside the convenience store. I wanted to put some colour in but was reluctant to work on the original drawing. 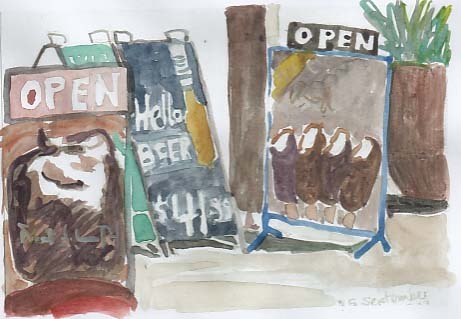 Thankfully we now have scanning and printing so here is a coloured version of the sign drawing. 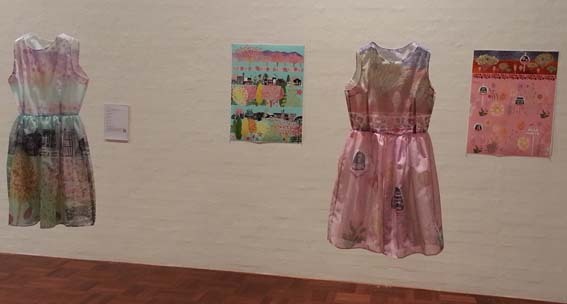 The NGA has announced its Big Draw day for 27 October. This year the Big Draw falls while the William Kentridge show, Drawn from Africa is on display (5 October to 3 November). That’s another good reason to get along to the NGA. 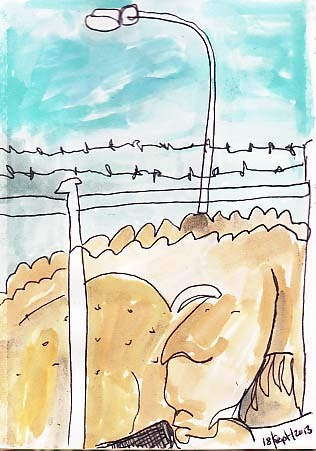 I’m planning to make it to the Big Draw this year as I’ve managed to be pre-booked every time it’s been held. Fingers crossed. 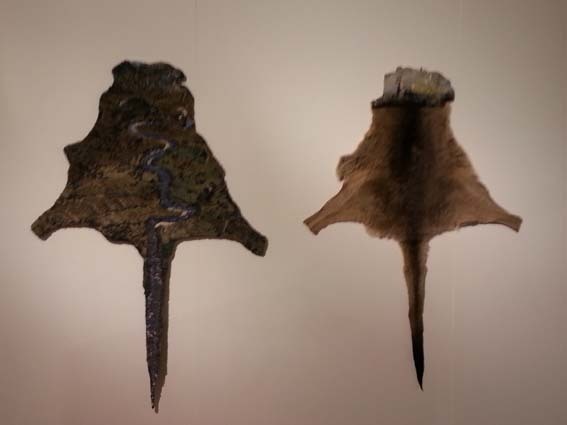 Shaping Canberra is an exhibition that opened this week at the ANU School of Art Gallery. 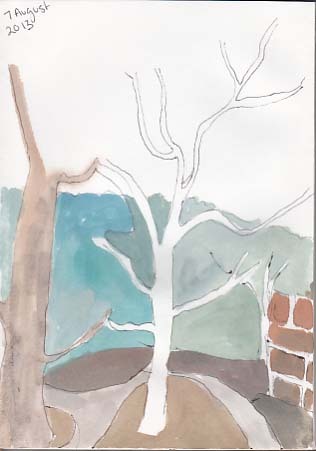 Curated by Ruth Hingston, this is an intriguing collection of works by Canberra artists, that approach Canberra from a personal perspective, one that is completely at odds with the widespread views of the city propagated by Australian media. I found the work engaging and thoroughly interesting. 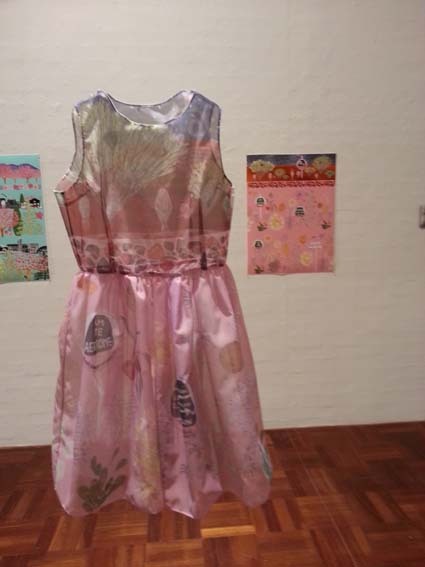 I was immediately drawn to the textile works of Annie Trevillian (one of my former teachers at the ANU) whose works represented the divergent lives of herself and her twin sister. 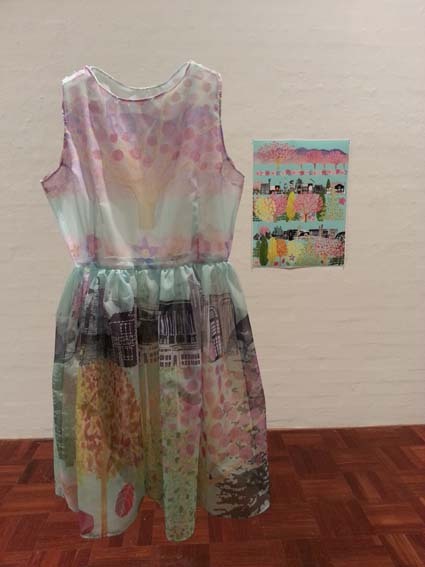 Trevillian used digital printing to turn studies into frocks reflecting on their lives in Canberra and Oodnadatta. Brenda Gogg’s tapestries, Home Ground I and II were just amazing. A great concept that was beautifully realised. 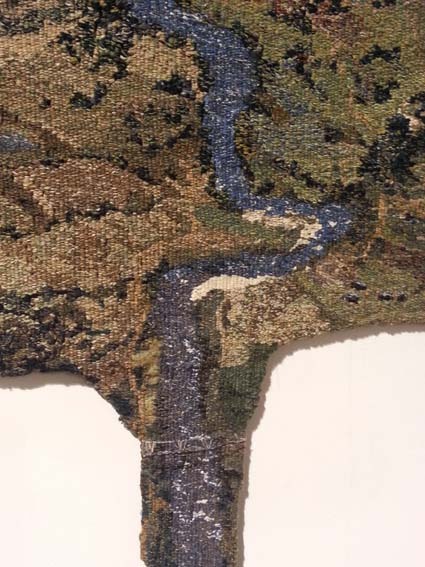 Detail, Home Ground I, Brenda Goggs , 2013 tapestry. Equally engaging were the digital images of Josh Dykgraaf, whose perspective on Canberra was a wild mash-up of Canberra buildings – a sort of Howl’s Moving Castle meets the National Capital Authority. I also wrote, (yes you are invited to), in one of the altered books made by Ampersand Duck (Caren Florance). This is definitely an exhibition that you can spend plenty of time at. 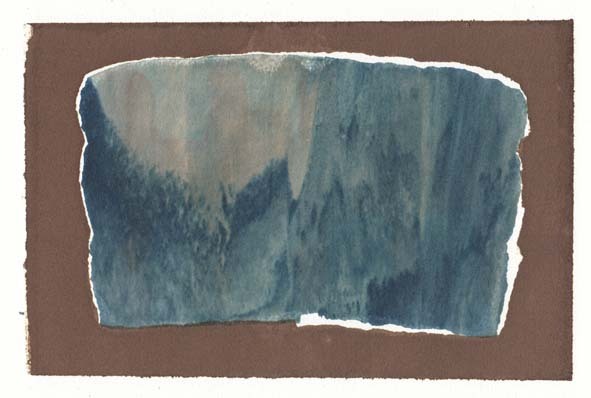 There are numerous works I haven’t mentioned and the standards are consistently high across them all. Shaping Canberra: The lived experience of a changing landscape, 18 September to 19 October 2013, ANU School of Art Gallery. Back at the Megalo Studio this week for another session of printing. In the gallery there is a review show of all the 2012 Megalo artists-in-residency. 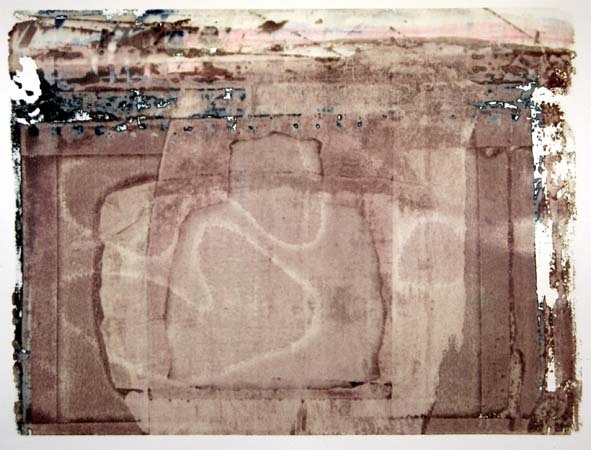 Some lovely work including that of Jan Hogan, whose interactions with the landscape are always thoughtful. The process I’m using works by building-up layers of images. I print in layers so sometimes good images come quickly, other times they may take all day. This time it was only after lunch that I found my best images of the day. 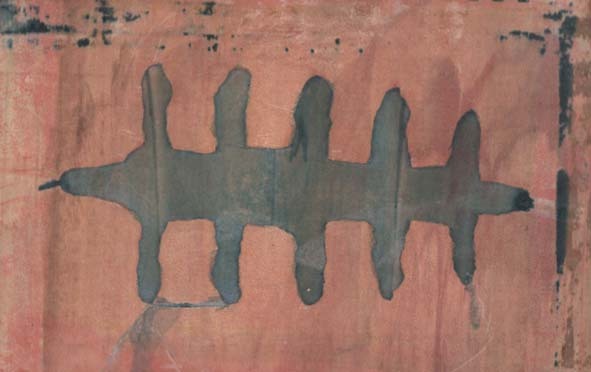 Vessel image, a left-over from the previous printing session, 11 September 2013. This reminded me of ‘landscape marble’ which is valued in China for its natural resemblance to Chinese brush painted landscapes.